It was great to finally be back in our great state of Texas, and the lure of home was great. But so, too, was the lure of Texas Tech Law, which several of the LEAP Ambassadors–particularly Karla Rosales–aspire to attend. …where we got to see a lot of cute prairie dogs! The weather was rainy, but that did not stop us or them from having a great time. We then headed to our next stop, Texas Tech School of Law. This was particularly the best part for me, as Texas Tech Law is my top-choice law school and it was my first time to be able to visit the school. … and the Mark and Becky Lanier Professional Development Center where the auditorium and the Donald Hunt Courtroom are located. We continued our exploration of Texas Tech and learned that Texas Tech actually has a lot of public art and beauty throughout their campus. We saw a couple of Jesus Moroles sculptures, which are always nice to see as we can make that connection to Huntsville. We also saw an art piece by one of my favorite artists, Deborah Butterfield. The piece was titled “Water River” and depicts a life-size horse. 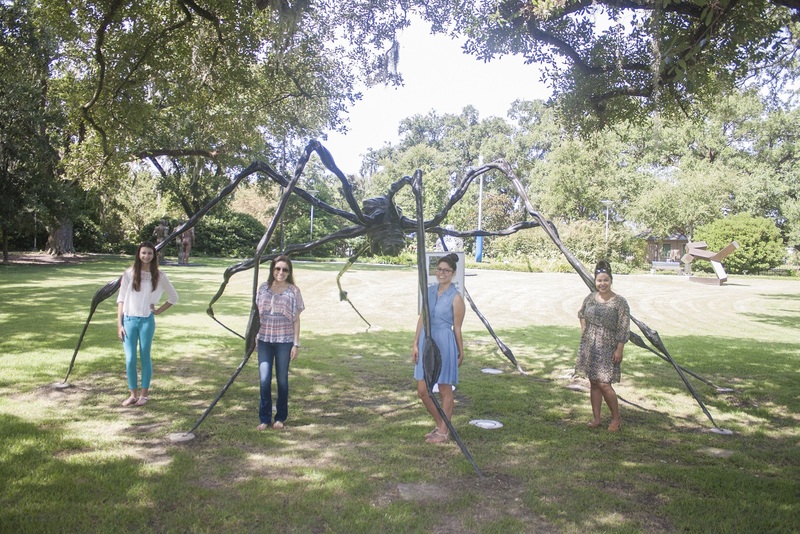 …which we have learned so much about at the Moody Gallery in Houston. One of the other artists we have learned about on this trip is Glenna Goodacre, who does representational sculptures, and is from Lubbock, TX. We had seen her art in Santa Fe, Albuquerque, and Denver, and, just off Glenna Goodacre Blvd in Lubbock, we were able to see her on Texas Tech’s campus. In fact, we were able to pose as her figures! And with that last glimpse, we headed back to our home in Huntsville. The last day of our Western tour would include a lot of driving through Texas as we made our way back to Huntsville. We broke up the day with multiple stops along the way and incorporated many of our favorite things into our drive! We began our morning in Lubbock–home of Mac Davis and Buddy Holly–by creating our own tour of Texas Tech’s campus public art. For Brian and Christina this was their first time at Texas Tech University. 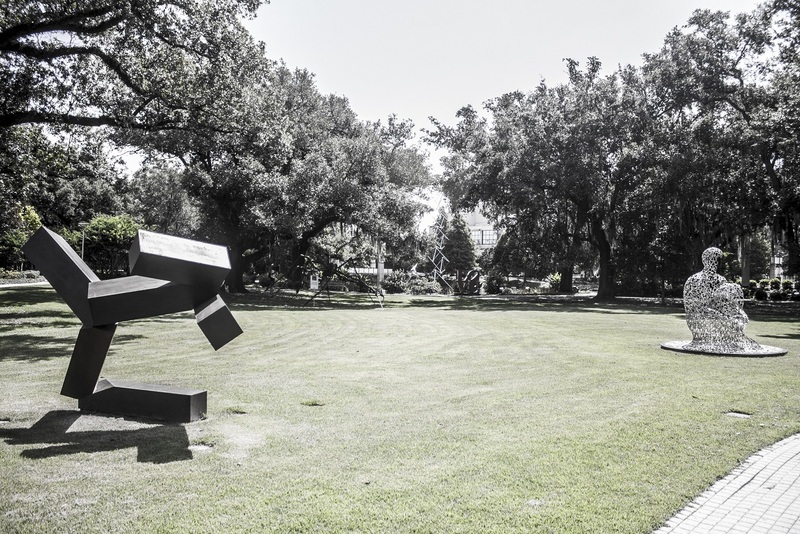 They are known for having a remarkable public art collection on campus because of Texas Tech University System’s public art program. We began by mapping out our art scavenger hunt that Professor Yawn had scouted out the night before. The first sculpture we saw was The Read Reader (a play on “Red Raider”) by Terry Allen, an artist we became familiar with thanks to Betty Moody. …and Prometheus by Charles Umlauf. As we kept walking we also saw a familiar piece by Glenna Goodacre. We had seen her work at the Albuquerque Art Museum, so it was exciting to recognize her art. 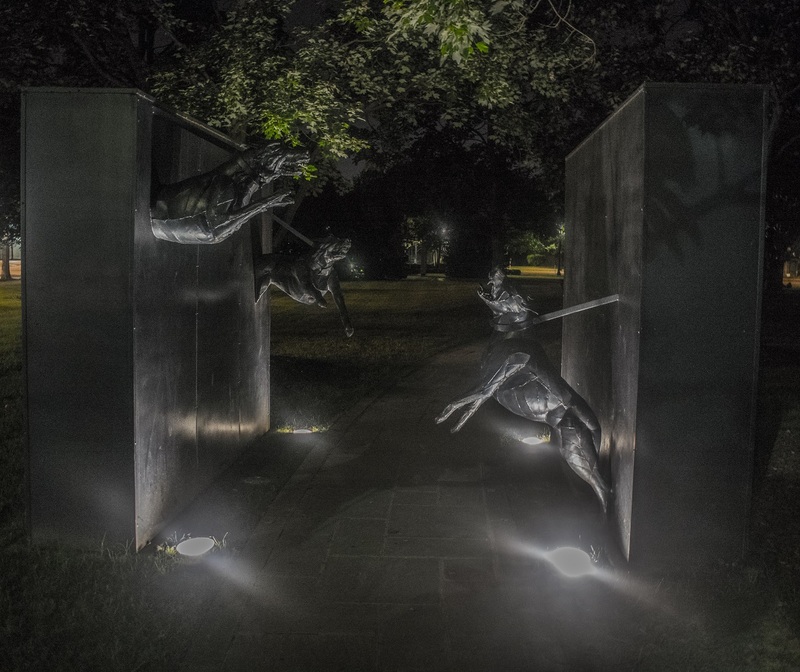 Professor Yawn led us to a Jesus Moroles sculpture, The Lapstrake Gateway: A Portal of Discovery. 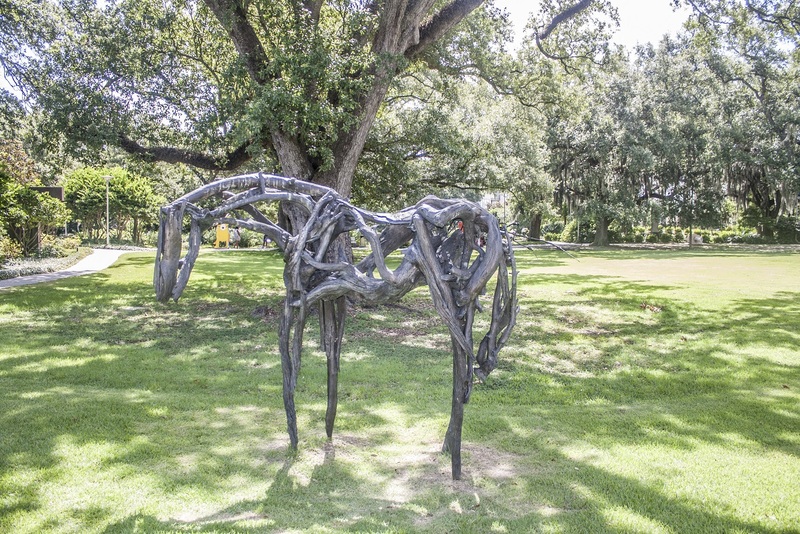 Professor Yawn told us to keep lookout for a horse sculpture, but we had no idea it was a Deborah Butterfield horse! One of the last sculptures we saw was the Steel Horse by Robert Bruno near the Architect building. Bruno was a new artist to us, but it wouldn’t be the last of his art to see in one day. 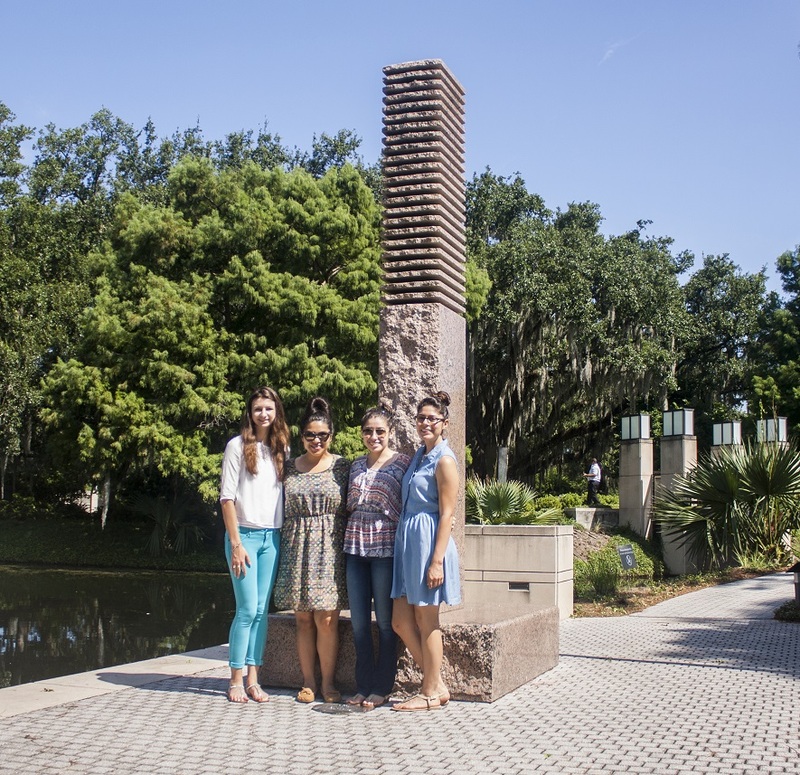 We definitely enjoyed looking for familiar art around the campus and worked up an appetite too! We knew our trip to Lubbock would be incomplete without sampling Spanky’s famous cheese sticks. We ordered two plates and sat down to enjoy them. They weren’t as large as we remembered, but they were sufficiently large that we didn’t finish them, despite their tastiness. Before leaving, we made a brief stop at the Buddy Holly Center, taking the opportunity to get a photo with Buddy Holly’s famous glasses–or, rather, an oversized version of them. Holly, the singer of “That’ll Be the Day,” “Peggy Sue,” “Everyday,” “Think it Over” and “Words of Love,” also had a huge influence on music, being a particular influence on The Beatles. Plus, his glasses sort of look like Brian’s. Before officially leaving Lubbock, we took a detour to a neighborhood overlooking a small lake. At first it looked like a normal neighborhood until we turned a corner and Robert Bruno’s home became visible. Robert Bruno taught at Texas Tech University’s Architecture department before passing away in 2008. He was even featured on HGTV’s “Extreme Homes” and The Learning Channel. 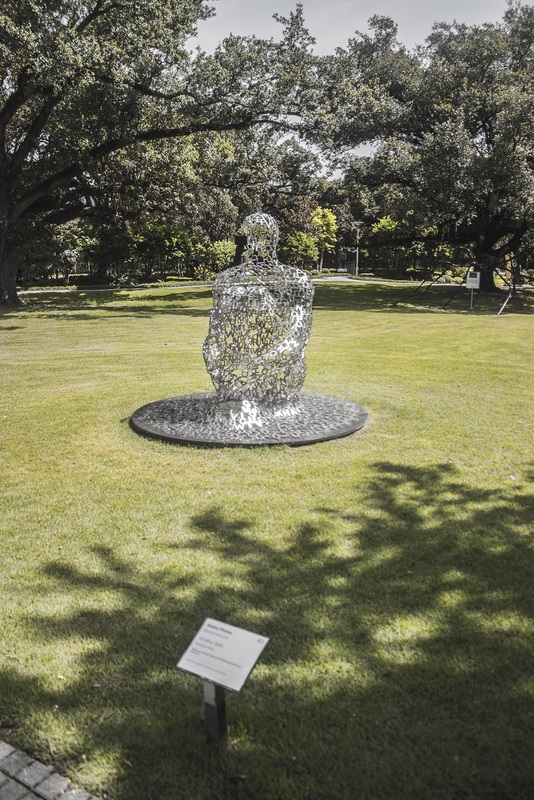 The home looked very similar to the sculpture on campus named Steel Horse. Unfortunately, he passed away before the home reached completion and it is now kept up and available by tour, with the hopes of completing the interior. We admired the originality and the architectural details of the home, and we were grateful that, although our stay in Lubbock was brief, we filled in as much exploring as we could. 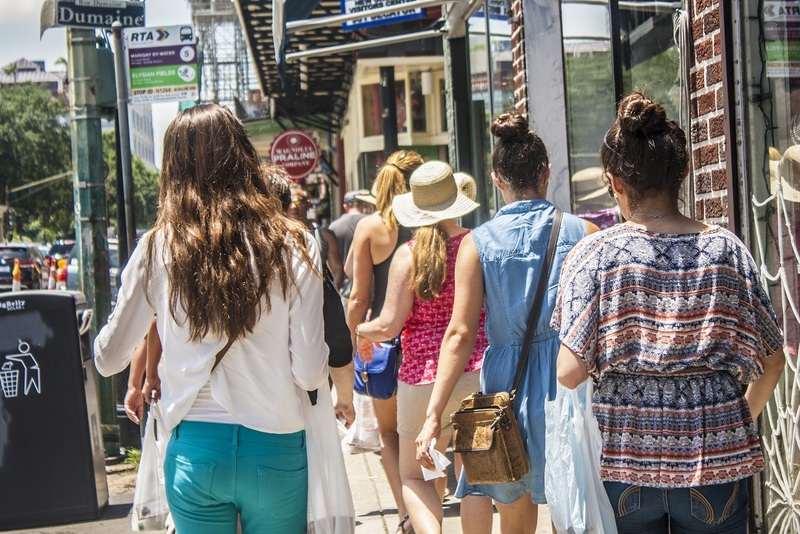 The mission of the LEAP Center is to provide unique learning opportunities and implicit in this mission is the idea of learning about new cultures and disciplines. 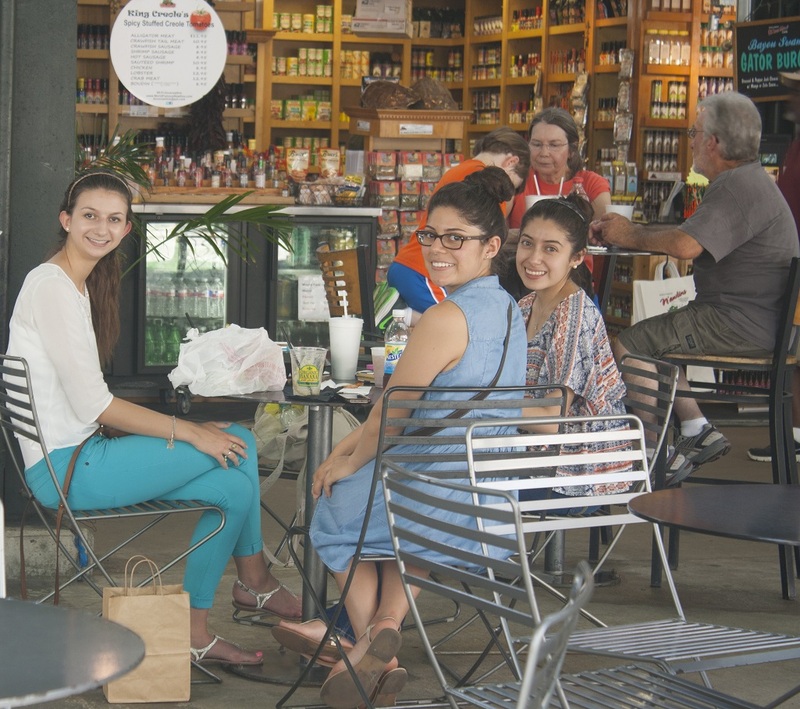 Cross-cultural and interdisciplinary learning were certainly central to our Houston “Arts and Parks” tour. We began our 2nd day of the trip with a visit to the Herrman Park Japanese Garden. We also marveled at an Isamu Noguchi residing in Ms. Moody’s guest room. Perhaps this recurring motif lead us to choose Azuma Sushi and Robata Grill for dinner. We found this as a great opportunity for some of the students to try new things. For some of the LEAPsters, this was their first time to try sushi. We ordered an array of sushi rolls, noodles, and other traditional Japanese plates so that everyone would have a chance to fulfill their culinary curiosity. More curiously, it was Makayla Mason’s first time to try ribs. We all ignored the fact that this Texas life-long resident had never had one of the state’s most iconic meals and recognized her adventurous accomplishment. Empowered by this adventurous spirt, we took a drive down Houston’s still-roaring roads to visit the Houston Police Officer’s Memorial. Designed by Jesus Moroles, the memorial resembles a Mezo-American pyramid with its geometric outline and elevating levels. Rising in the middle the field, the structure commemorates the lives of fallen Houston police officers. 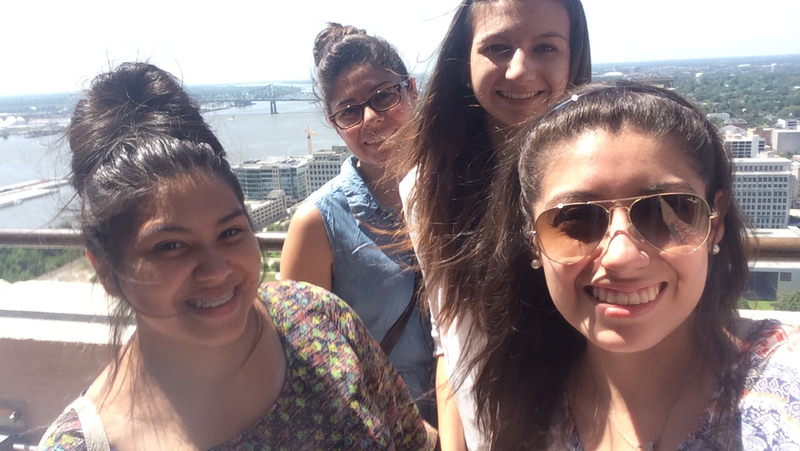 Under the twinkling skyline of the city, we climbed the memorial to get a better view of the mesmerizing vista. Such added adventures made for a late night, but with rain in the forecast, we were promised a late morning start, allowing us to get ready for a continuation of our multi-cultural adventure. 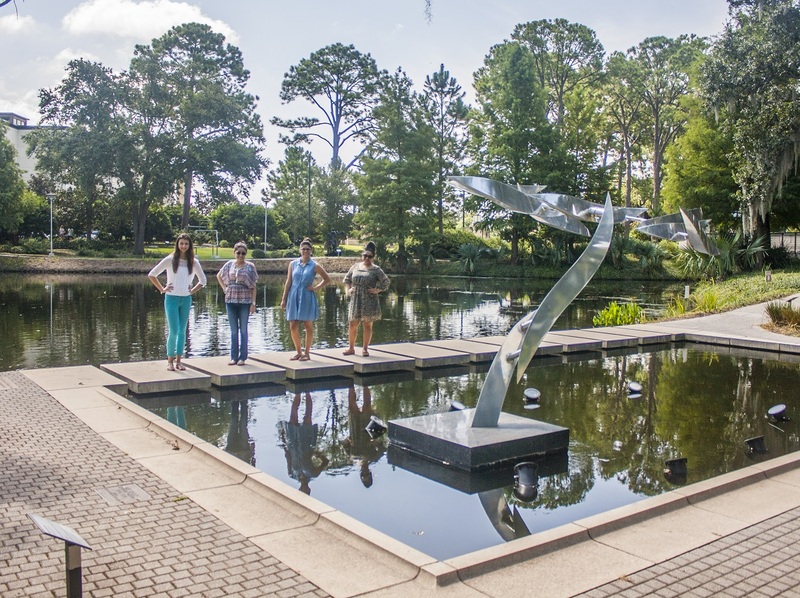 Well rested and eager to leap into the day’s adventures, LEAP Ambassadors embarked on the final leg of our Houston Arts and Parks Tour. To begin our day, we drove to the Asia Society Texas Center. 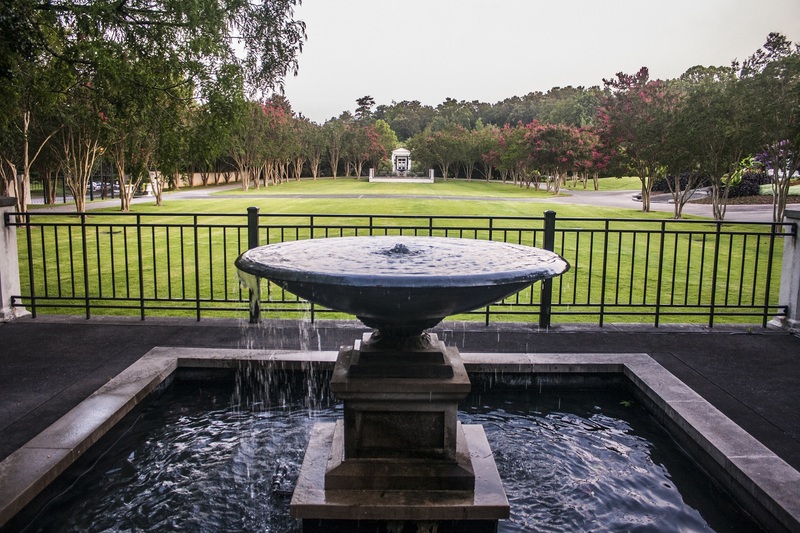 Established in Houston with the help of former First Lady Barbara Bush, the center provides community engagement for Houston residents of Asian heritage and those wanting to learn more about the culture. Before entering the art gallery, we admired the architecture of Yoshio Taniguchi, a Japanese architect, and learned about the design. Both inside and outside, Professor Yawn emphasized the horizontal lines traditional to that of Asian architecture while the building’s vertical lines incorporated American design into the structure. 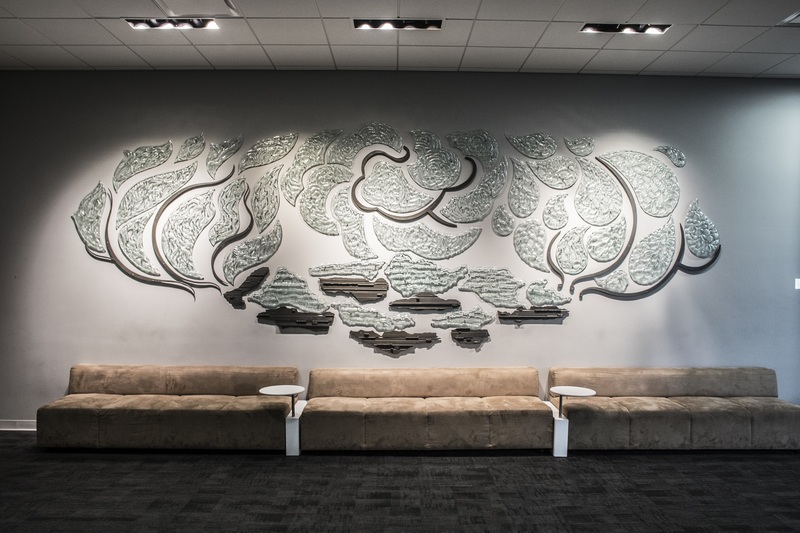 This was designed by Taniguchi to bind the American and Asian cultures together. The first floor of the Asia Society houses a café, theatre, and art gallery. The gallery included numerous paintings by . Born in India, he earned his Masters in Fine Arts from Indiana University and now teaches at the Maryland Institute College of Art (MICA). Majumdar created works of abstraction. But unlike other artists specialized in this discipline, Majumdar depicts the convergence of cultures through his art work. A prevalent motif is also theatre, as he has experience in this profession and uses it as inspiration. His paintings allude to this trade, and depict images of performers getting ready for a play or the proscenium of a theater. Craving a more realistic representation of theatre, we entered the Brown Foundation Performing Arts Theater, adjacent to Majumdar’s art work. With walls lined with cherry wood panels and seats designed by Poltrona Frau, leather seat maker for Maserati and Ferrari, the acoustically rich theatre was spared no expense in order to achieve an excellent viewing experience. We had a chance to play around on the front stage and bounce on its Appalachian white oak floors. And even though the ever present use of wood in the building’s walls and floors is an aesthetic pleasure, nothing compares to the beauty of the artwork we were about to see. Upstairs in the Sarofirm Gallery, we had the opportunity to learn about modern Japanese bamboo art. A new form of art for many of the LEAP Ambassadors, we were amazed by the craftsmanship in every piece. These artists, some of which come from families dedicated to this craft for generations, have mastered the technique to shape bamboo into whatever form they please. The process requires a developed taste for perfection and a precision to delicately weave one of nature’s strongest natural substances. Interestingly, many of these pieces had a functional purpose. For example, one of the artists made his piece so that it could function as a fruit bowl, while another crafted the bamboo to use it as a vase. It left us with much to ponder. It also capped off the Asian theme of our trip. Having seen work by Naguchi, visited the Japanese Gardens, eaten at an Asian restaurant, we now had an extensive exploration of Asian art and architecture. 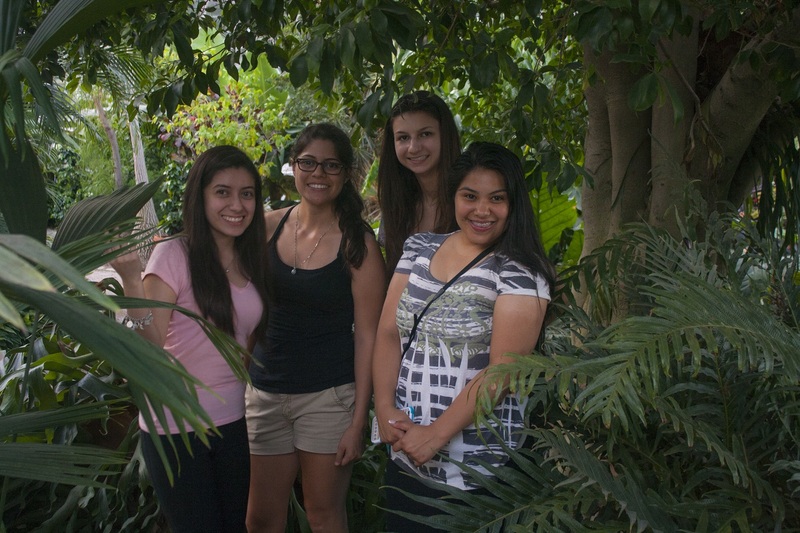 It wouldn’t be our last exploration of the trip, but it was one of our most fulfilling! 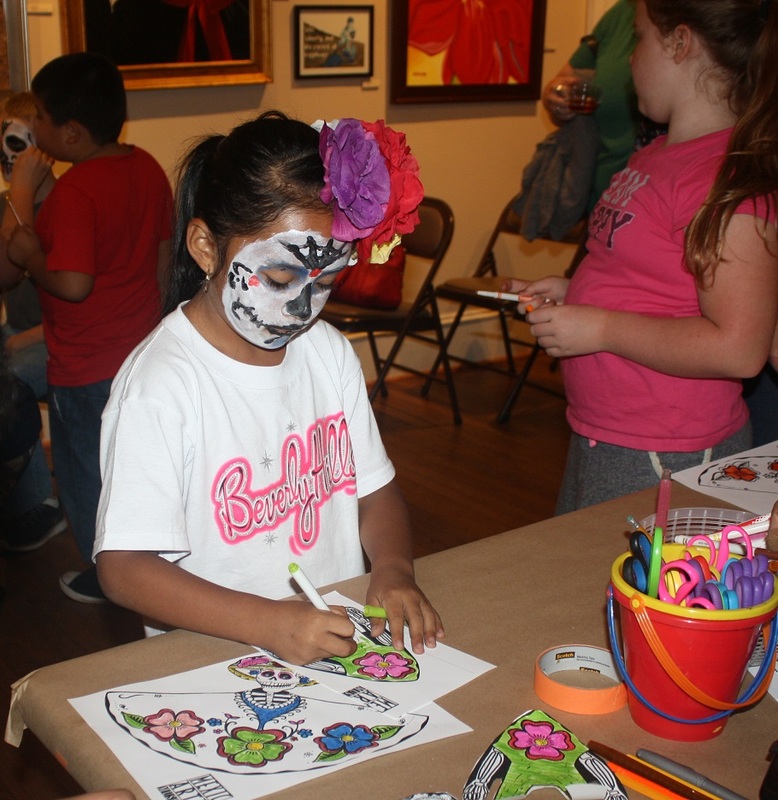 Day of the Dead or Dia de los Muertos is a Mexican tradition that celebrates lost loved ones in a an intimate way, and it is celebrated at the Wynne Home Arts Center annually. For each individual lost loved one, family and friends build an altar that reflects the life they lived. The altar is composed of favorite foods, flowers, candles, and objects that they cherished. Those who celebrate this holiday believe that during the night the deceased will come and enjoy what they have left for them. Similarly, the Wynne Home built two altars for the lost loved ones that made a great impact in Huntsville, Texas: Jesus Moroles and Barbara Tyson. The two artists have both done work for the Wynne Home as well as in the community. With both of the artists passing this year, the Wynne Home wanted to honor and commemorate their lives by building them altars. 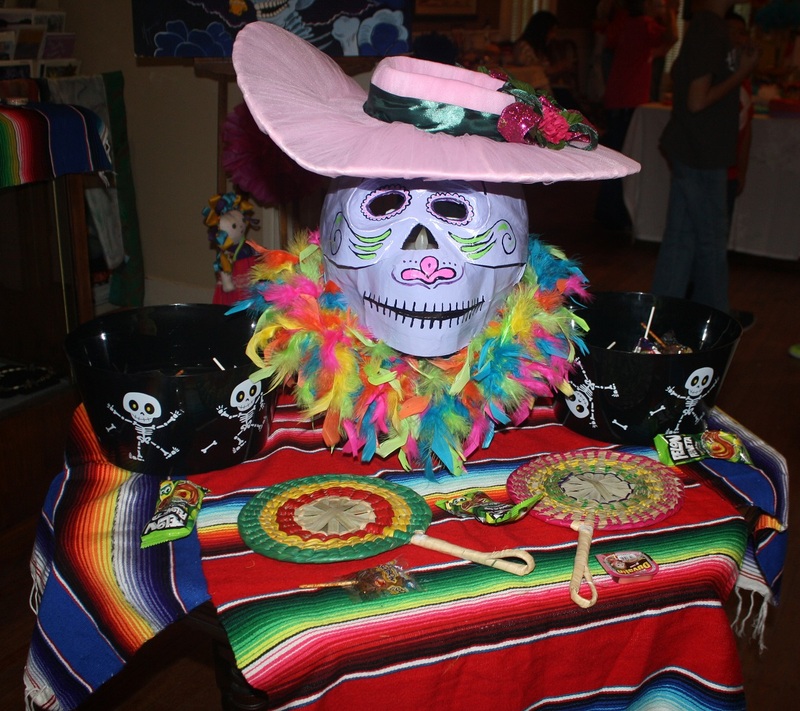 The altars will be on exhibit until November 12, 2015. 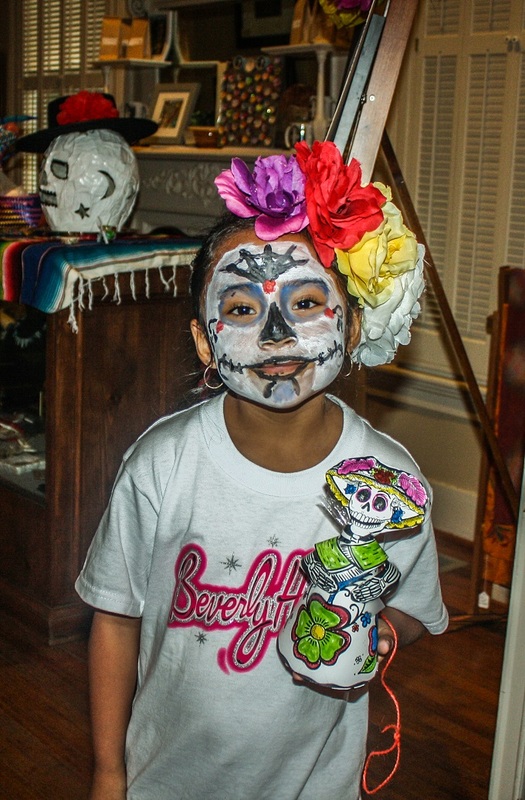 …and a showing of “The Book of Life” for children. 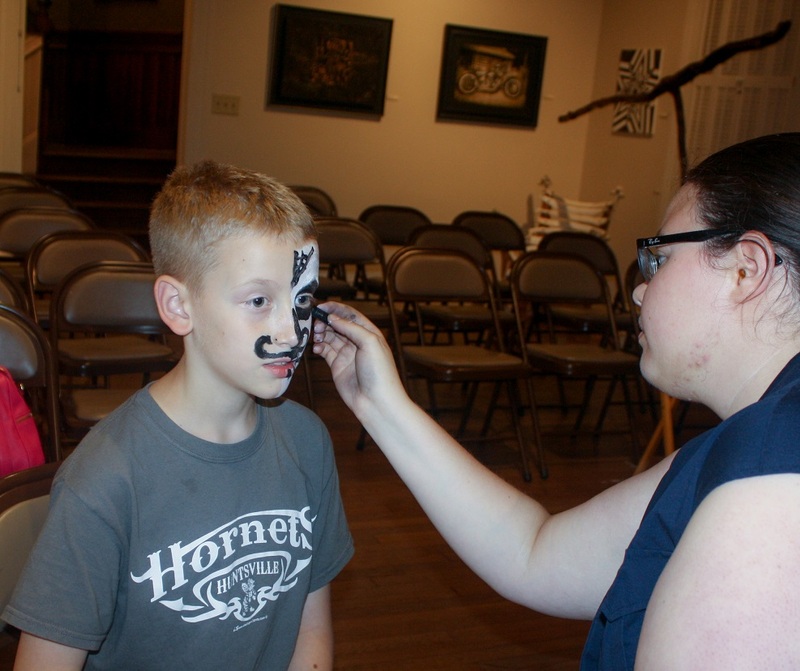 LEAP is very proud to volunteer at They Wynne Home—a place that advocates cultural diversity and art. It was a joy to see so many locals take part in this tradition that is cherished by many! 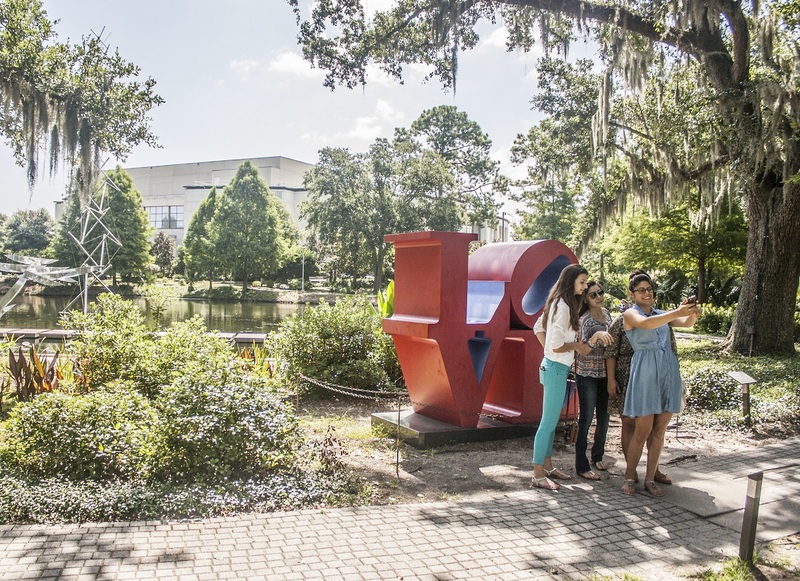 Driven to learn more about the community, LEAP Ambassadors are participating in the heART of Huntsville program, which promotes local arts in the Huntsville area. The program consists of four meetings, each with a different artistic theme, tour guides, and participatory activities. 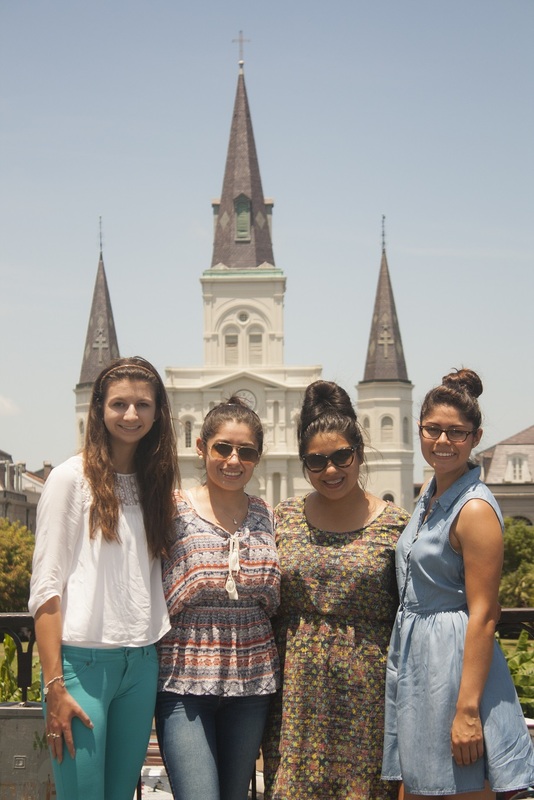 As Ambassadors, we were excited to once again learn more about our campus and community. This excitement, however, was dampened–literally–when, just minutes before the program began, it began to rain heavily. Ambassadors President Megan Chapa, in charge of driving one of the golf carts, arrived from across campus a bit worse for the wear. Professor Yawn, also driving a cart, arrived with one leg completely drenched. 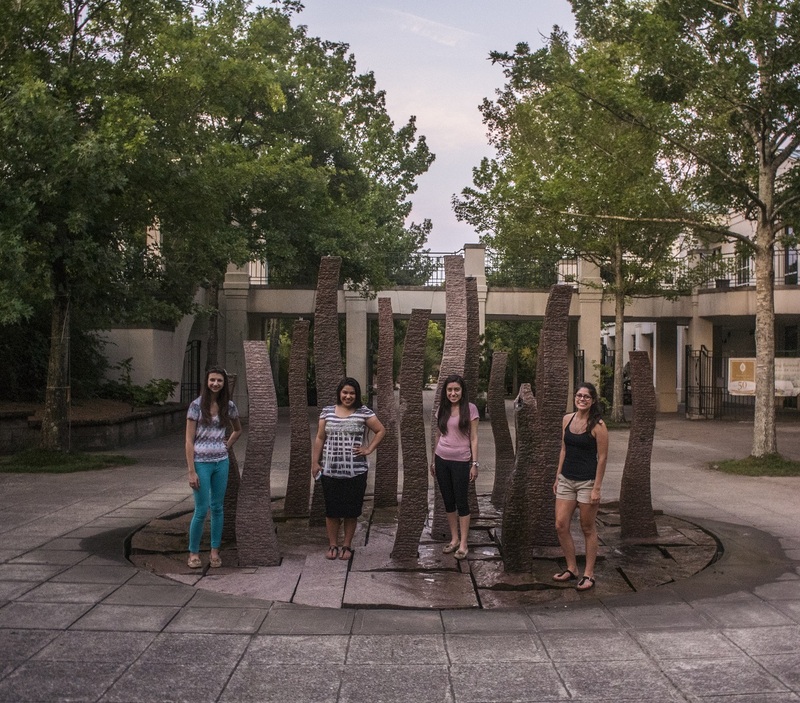 It occurred to us that the program’s participants would probably find the campus’s art much more appealing if they weren’t having to stand in the rain to view it. Fortunately, the rain calmed eventually and we all managed to arrive at the Art Department to kick off our first meeting with staff, locals, and faculty, albeit a bit belated and somewhat damp. We began at the Gaddis Geeslin Gallery, where Professor Henderson, the chair of the art department, kindly welcomed us and gave us some background of the art department. 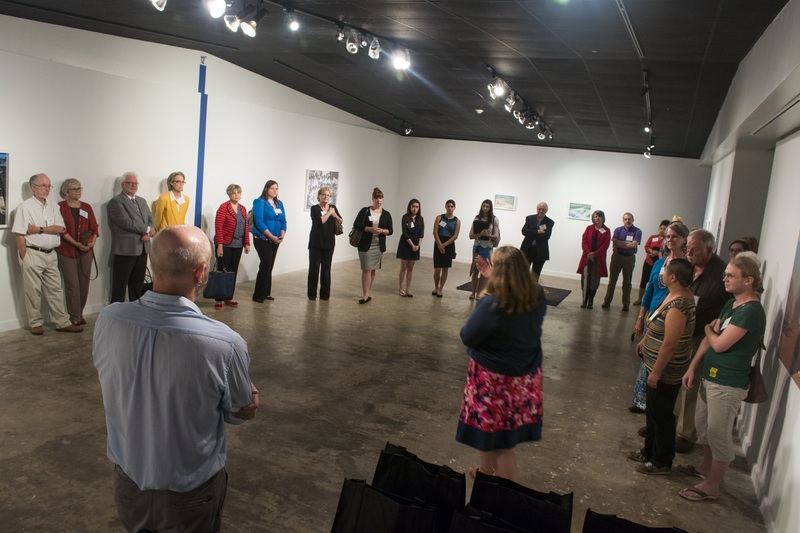 At that time, Dr. Melissa L. Mednicov introduced us to the “Still Summer” exhibit, with work by Debra Barrera and Kelly O’Connor, and gave us a closer insight at the background of the exhibit. 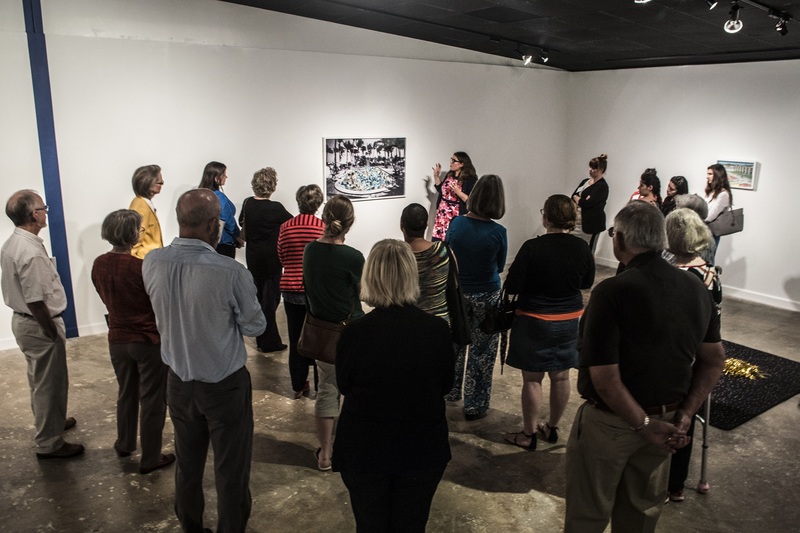 While O’Connor’s work emphasizes memory, fantasy, and fiction; Barrera’s work emphasizes personal memories, specifically relating to her childhood participation in sports such as swimming, seen in most of the art in the exhibit, such as “Pool Rules” or “Bottom of the Pool”. Another piece of work we found fun and interesting was “Selfies on Mars/Selfies on Earth”, where we of course could not miss our group selfie with Mrs. Woodward, Mrs. Pease, and Dean Shields. Before heading out to the Lowman Student Center Art Gallery, we all took a survey to test our knowledge of Huntsville community art so far. By the end of the program we should be able to see an improvement in knowing and recognizing artwork locally. 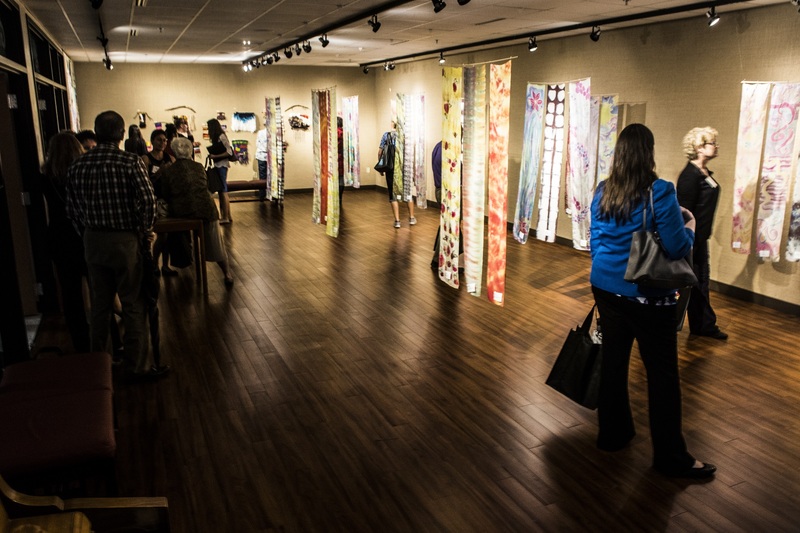 Next, we arrived at the LSC Art Gallery where we enjoyed an exhibit offered by Professor Trish Ramsay, whose Family and Consumer Science class produced scarves and other textiles. The pieces were beautiful and creative. As a bonus, we learned a bit about the large piece of art outside the LSC art gallery. 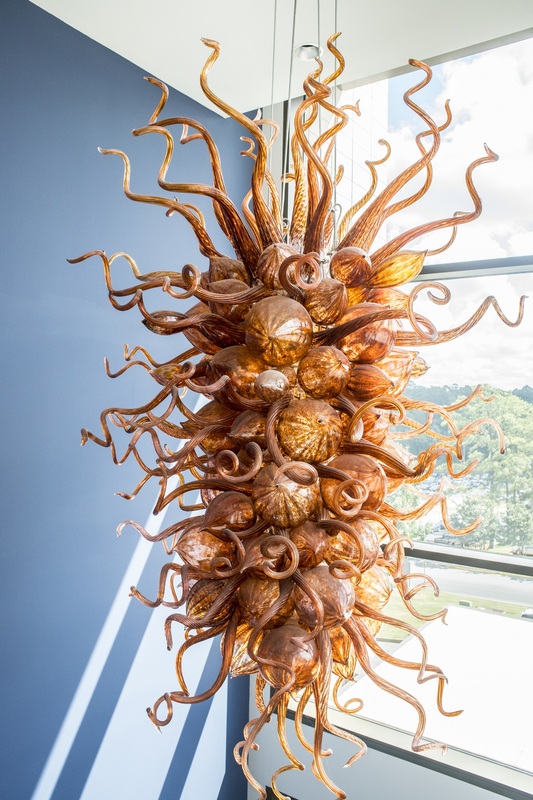 Turns out, it is a piece by James Surls, who graduated from SHSU. 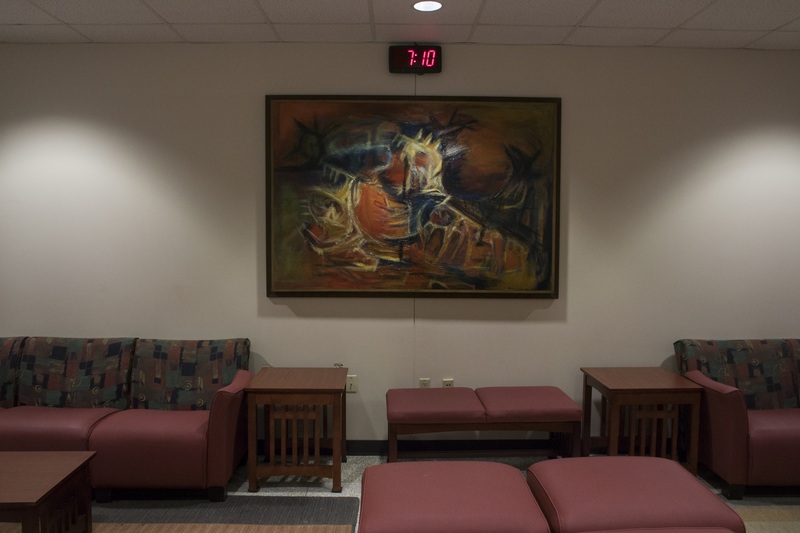 The piece, unlike almost any of his other work, was done when he was a student at SHSU in the 1960s. Following the scarves exhibit, we moved to the Gaertner Performing Arts Center where we enjoyed a walking art tour. Craig Brossman, the Facilities Manager of the GPAC, gave us a tour of the Concert Hall, Dance Theater, and Recital Hall. Turns out, an acoustician (!) was hired to design the rooms in such a manner as to make the sound optimal, while also providing state-of-the-art technology. This tour was filled with interesting information (Recital Hall fits 790 people!) and provided rich information about a building that was named among the twenty-five most impressive University Art Centers in the United States. and various pieces by Stanley Lea. To end our educational evening, we had dinner at Austin hall, the oldest educational building in continuous use west of the Mississippi and the most notable landmark on campus. 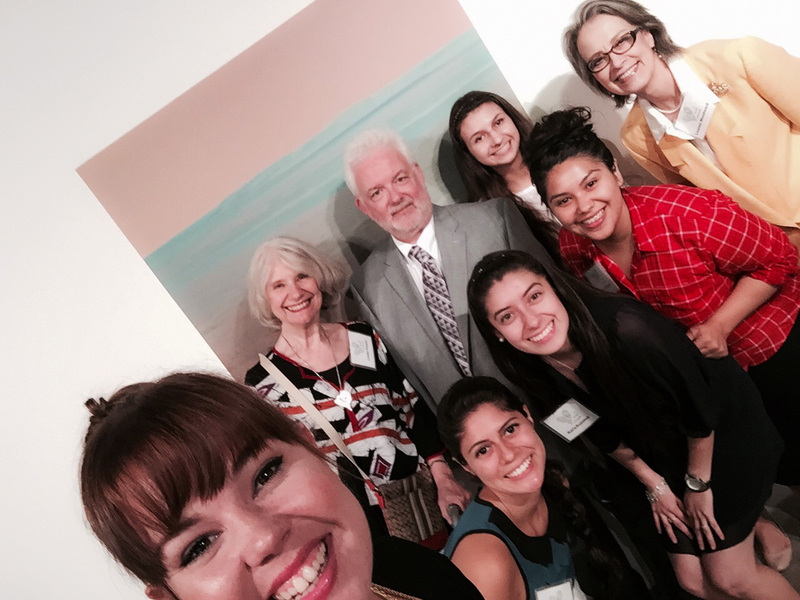 We are so thankful to Dean Shields and the College of Mass Communication and Fine Arts for sponsoring such a wonderful evening. We left stuffed with food and knowledge, eagerly awaiting the coming weeks of fun and surprises. 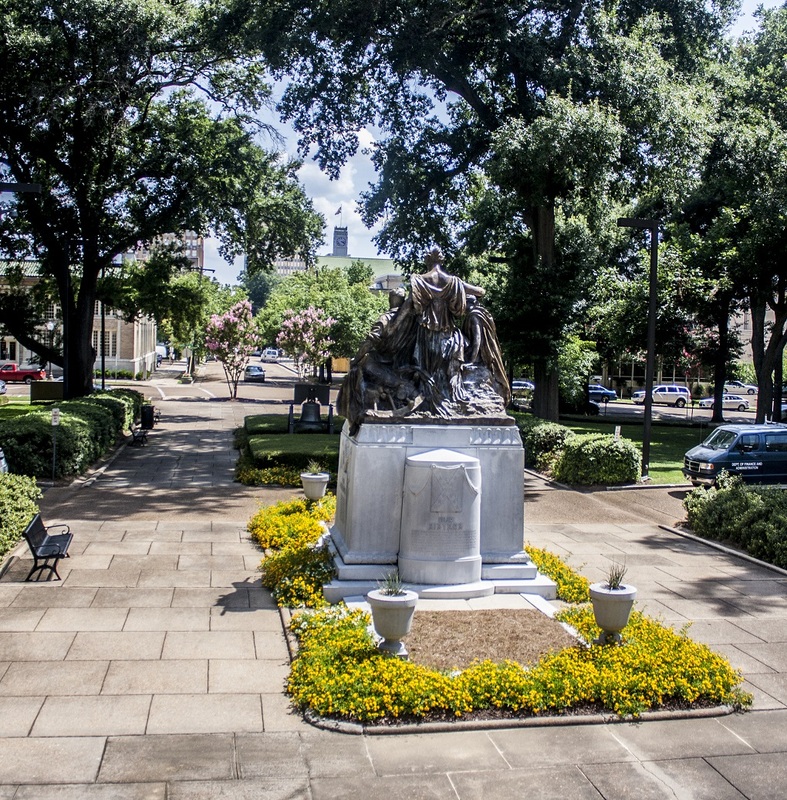 Next week we will focus our attention on the outdoor art of Huntsville, Texas and the artwork of David Adickes. It was 3:00 a.m and while most were sleeping, LEAP Center students hit the road to begin our tour of the Deep South. We were so excited to go on this 8 day trip because for most us, it was our first time in many of the destinations we will hit upon. Although Georgia is our final destination, we traversed a total of five: Texas, Louisiana, Mississippi, Alabama, and Georgia. Each state border presented the perfect opportunity for a quick stop and a group photo! To pass the time in the car, we played Charades, Trivia Crack, and Catch Phrase! 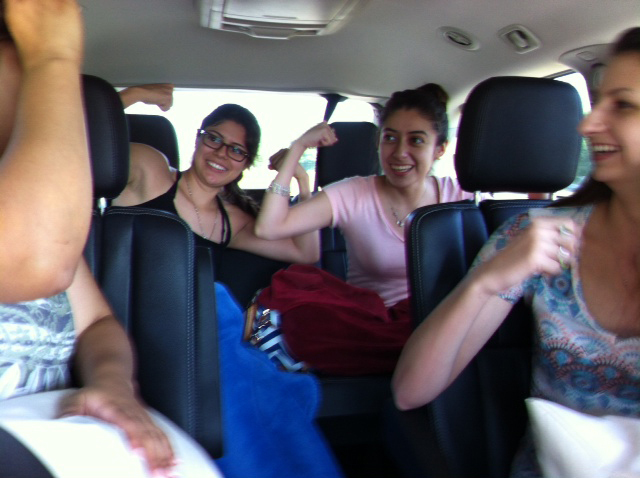 The day was filled with many laughs and fun facts which made the 21 hour drive fly by! Our first stop was in Louisiana, just outside the small town of Gibsland. What an excitement it was to see the historical marker where the infamous Clyde Barrow and Bonnie Parker were killed. Learning about Bonnie and Clyde in the classroom is interesting enough, but being at the historical marker really personified the history of the two. After this first stop I knew the day would be nothing less than amazing, and it was. Our first major stop of the day included a tour of the Civil War Battlefield at Vicksburg and lunch. Upon arrival, we viewed a film that taught us important background information about the battle and the grounds. During the Civil War, Vicksburg was a major holding point for the Confederacy. 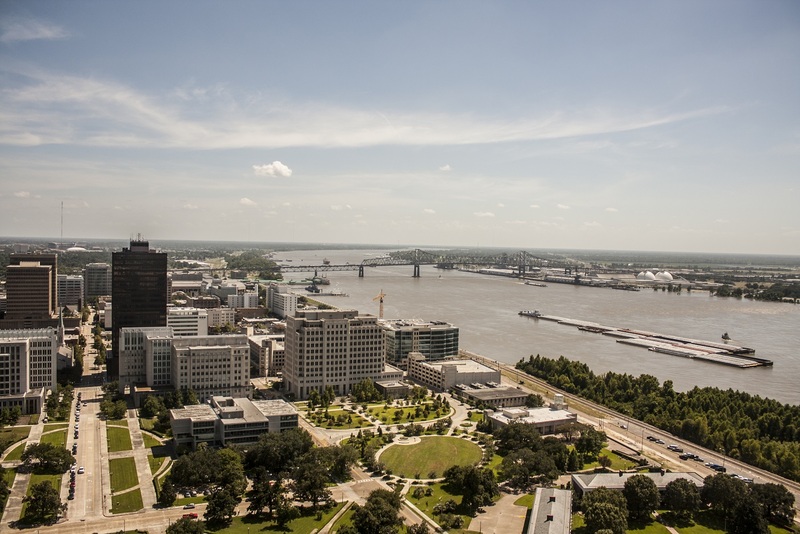 Bordering the Mississippi River, Vicksburg linked the two halves of the Confederacy together allowing them to pass supplies and support throughout the South. Several times during the war, General Ulysses S. Grant tried and failed multiple times to take control of Vicksburg from the Confederacy. However, on July 4th, 1863 the Union succeeded when the Confederacy surrendered its control of Vicksburg. 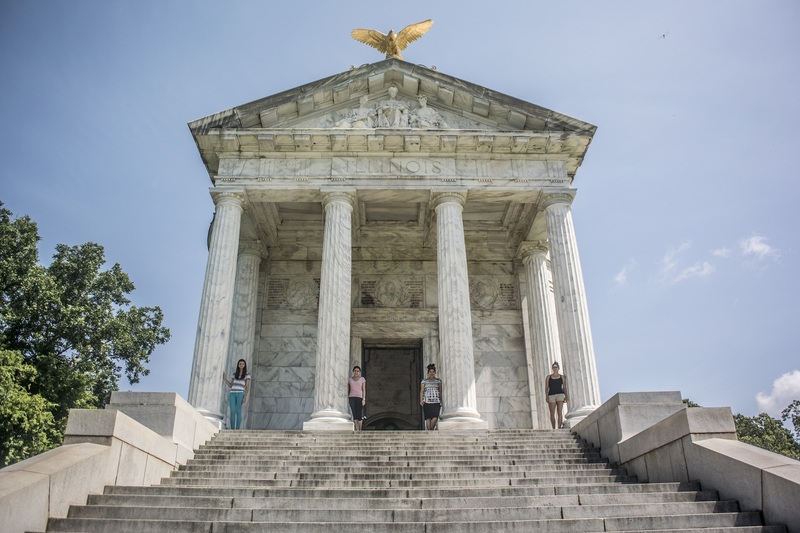 Following the documentary film, we loaded back into the car to proceed through the park where each state who sent soldiers to Vicksburg built a monument in recognition of their service and dedication to the war efforts. The first monument was also the most impressive. 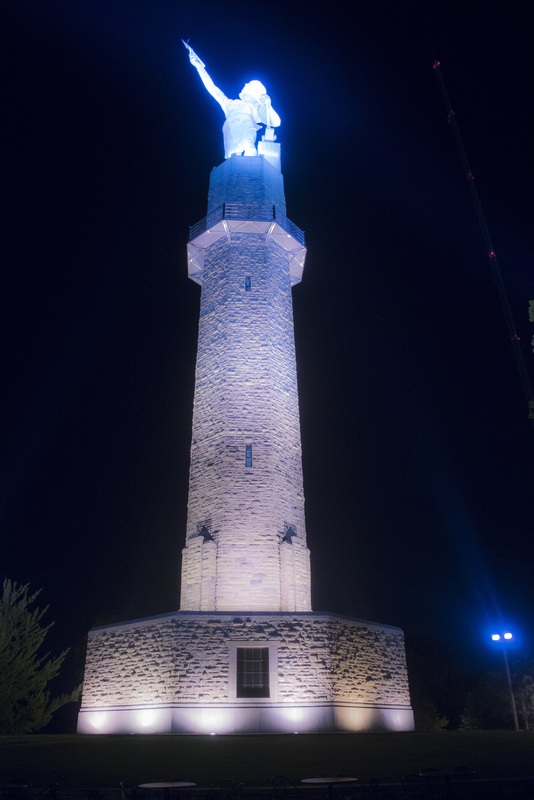 Illinois’ monument was intriguing for many reasons. 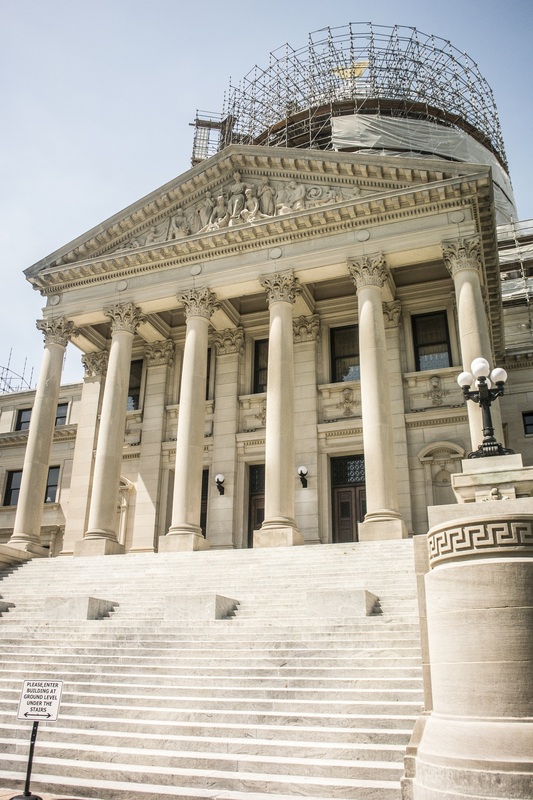 Before entering the intricate dome, visitors climb 47 stairs, representing the 47 days Vicksburg was under siege. Visitors now see vast hills covered in lush, green grass, but 150 years ago, these grounds constituted a deadly a battlefield. Even today, the lines of the trenches can still be seen underneath the grass. 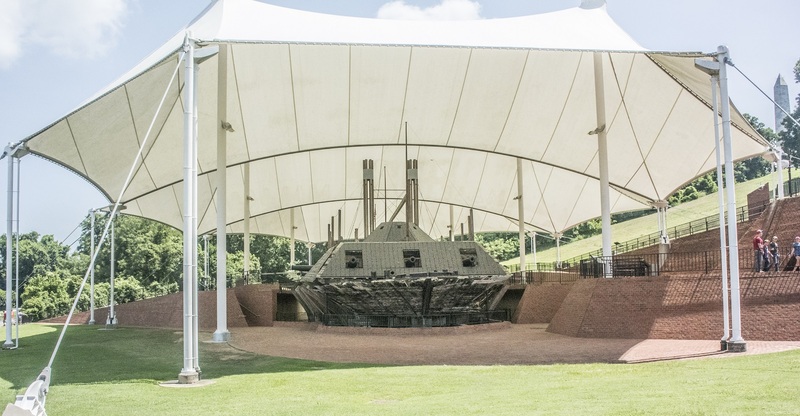 In addition to seeing the war efforts on the battlefield, visitors also see the U.S.S. 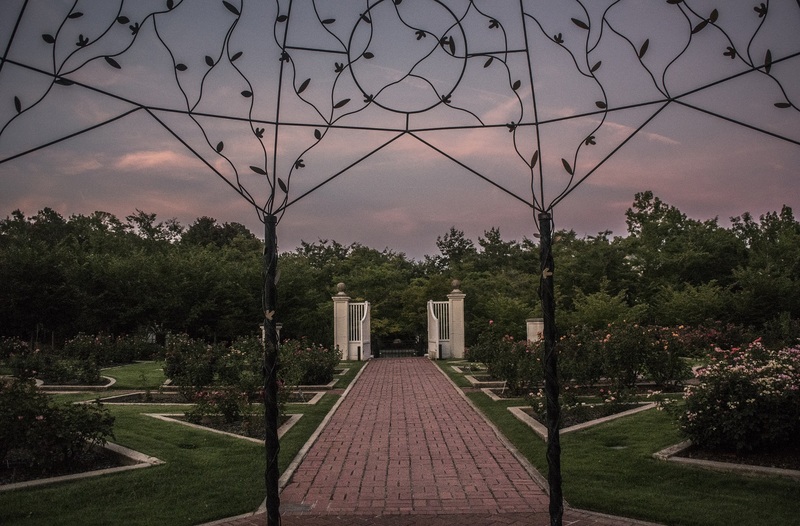 Cairo, which was sunk by the Confederates in 1862 and now resides in the park. Previously powered by steam, the ship required numerous crew members to maintain it. Interestingly, the crew members shoveled one ton of coal every hour just to help the ship move nine miles per hour! 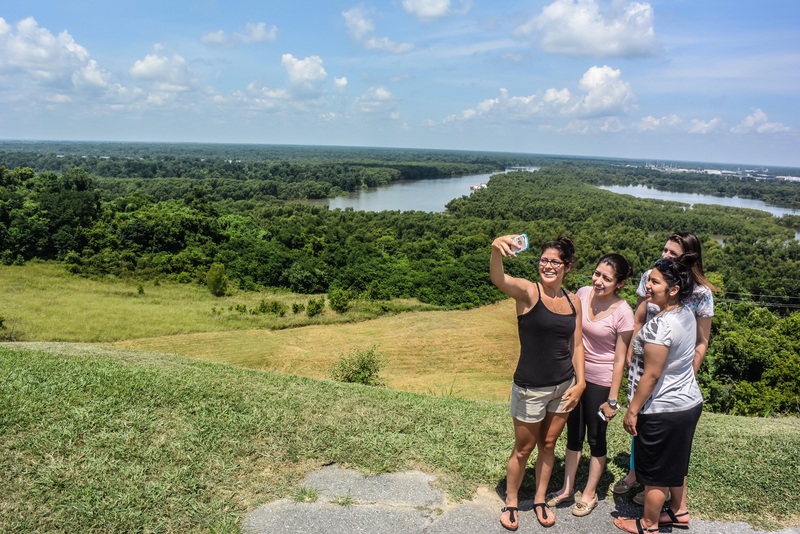 Nearing the end of the tour, LEAP students braved the heat once more to catch a glimpse of the Mississippi River from a cliff overlooking the river. From afar, we admired the power and beauty of the river as we piled back into the van to head to lunch. Following our tour at the park, we stopped to eat lunch at Martin’s in downtown Vicksburg. Immediately greeted with southern hospitality, we knew the meal was going to be great! A soup and sandwich style restaurant, the chicken salad with avocado was the favorite among many. Martin’s left us full, and ready for the next leg of our trip. Upon arrival to the state Capitol of Mississippi in Jackson, we were very nicely welcomed by the visitor’s center with pins of the state Capitol. 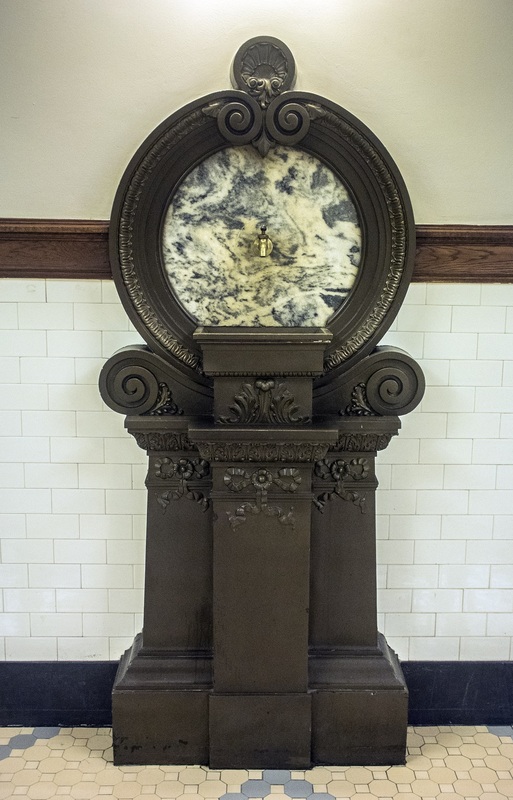 The very first artifact noted on our tour was our tour guide’s favorite piece in the building, the 1903 water fountain. This fountain was definitely much different from what we have today. Today we have a cooling system built in the water fountain, but back then we would need a block of ice if we wanted cool water. 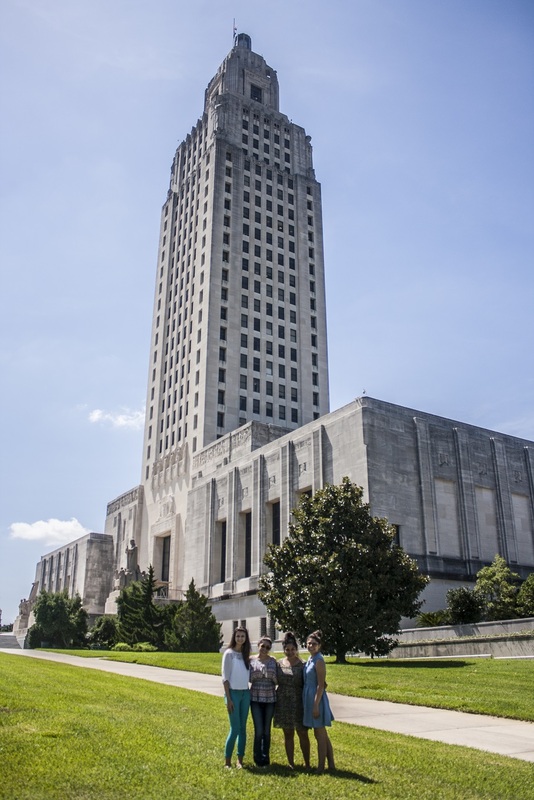 The Capitol was built in 1903 as Beaux Arts architecture style on the site of the old state penitentiary. It was built from funds awarded to the state of Mississippi from back taxes by the Illinois Central Railroad, and at the time cost about a million dollars–about 300 million today. A very different feature at this building were the light fixtures. It has about 4,760 light fixtures, with 750 in the rotunda alone. 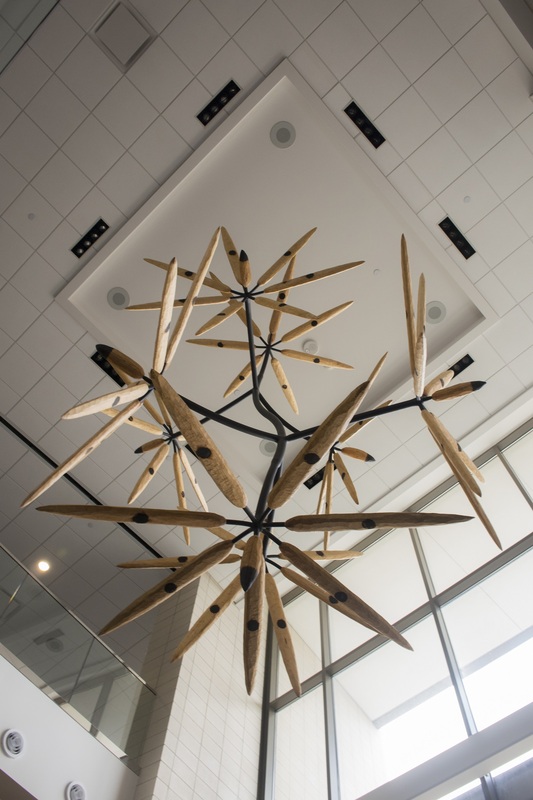 It is a very special fixture that beautifully lights up the interior of the building. The tour was expansive, covering the entire capitol. 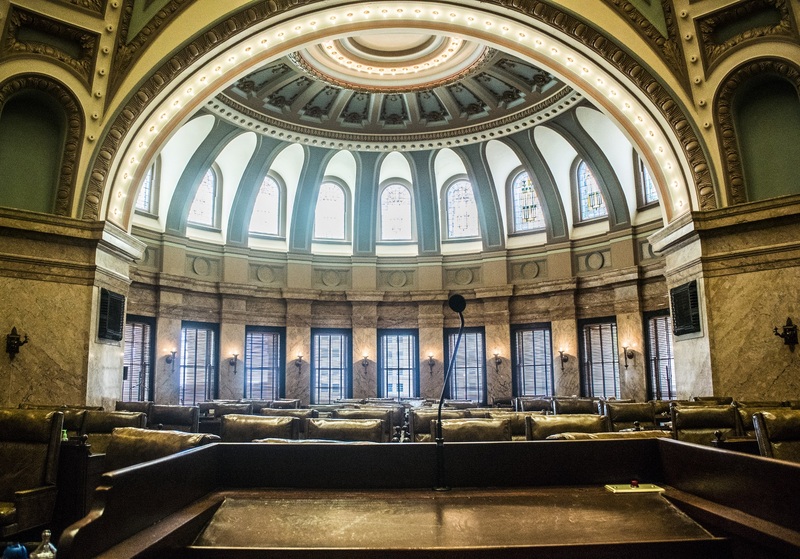 The first floor holds the hall of governors, and the second floor holds the original Supreme Court Chamber which now serves as the Senate Committee Room. On the third floor we found the offices of the Governor, the Lt. Governor, the Speaker of the House, and both the House and Senate Chambers. 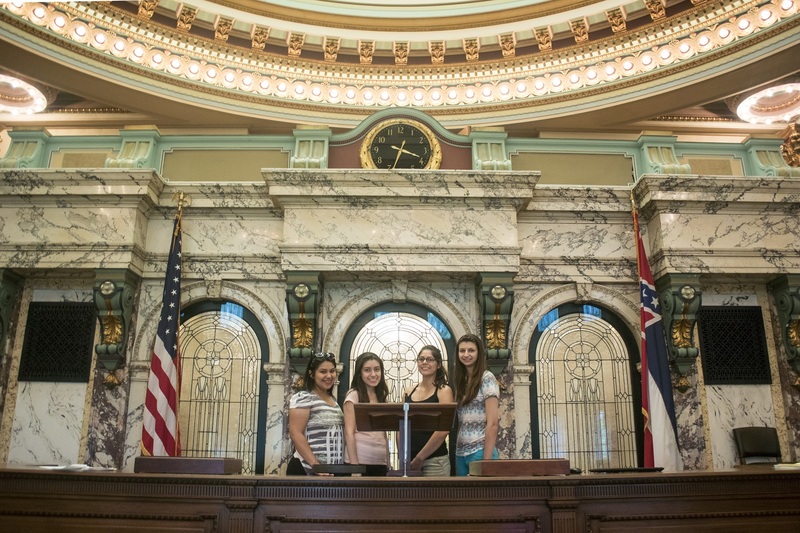 We got to spend time in both legislative chambers, and the setting was beautiful. Then on the fourth floor were the galleries where we got a clearer view of the House and Senate where we got to closely admire the domes of each chamber. The corridors of the fourth floor were especially different. Glass cylinders in the corridor floors to allow light to pass through the floor and illuminate the stained glass panels in the ceiling of the third floor. Finally, we ended the wonderful tour with a stop at the exterior where we admired the 8 foot tall made of solid copper which adorns the top of the capitol building. Many thanks to our wonderful tour guide, Ms. Pauline Akers. 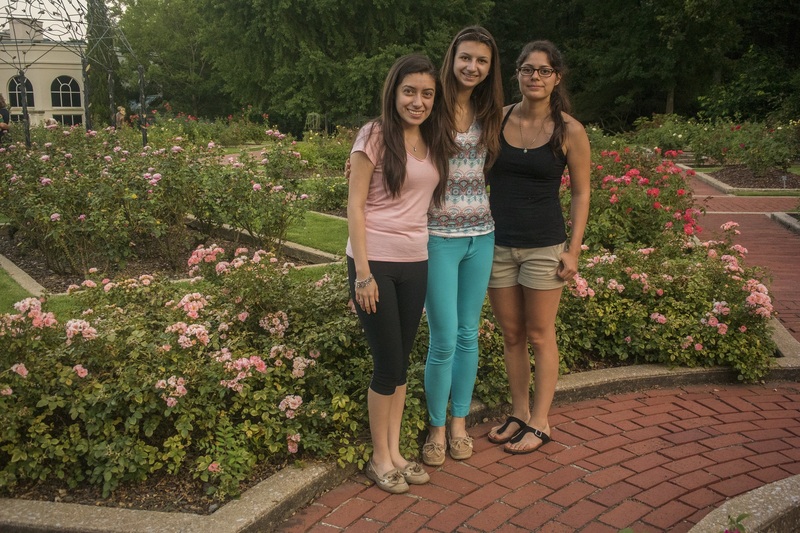 Surprisingly, we had time for a stop at the Birmingham Botanical Gardens. We were greeted by a wonderful sculpture by the recently deceased Jesus Moroles. Dining at John’s City Diner for dinner, the group was in for a real treat. Located in the heart of Birmingham, the diner’s decorum fitted with both modern and retro styles. Before our meals came, we had the opportunity to try fried oysters and “Fancy Bacon”, the latter of which was particularly tasty. When the meals came, the group was shocked. 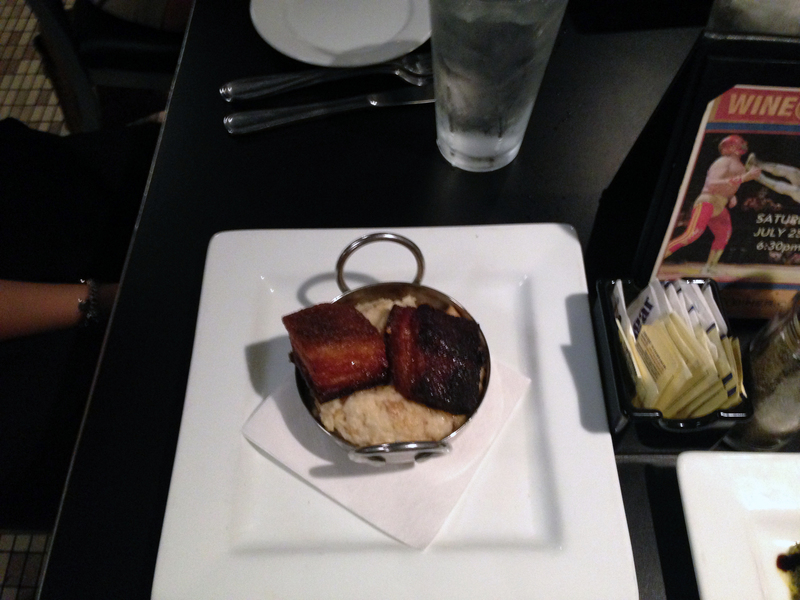 Many ordered John’s famous macaroni and cheese, which others order the chicken and waffles. Astounded by the portion sizes, we savored every bite we could. Dessert was just as delicious too, sampling from the restaurants most popular: Dark Chocolate Bread Pudding, White Chocolate Bread Pudding, and Frozen Lemonade Pie. 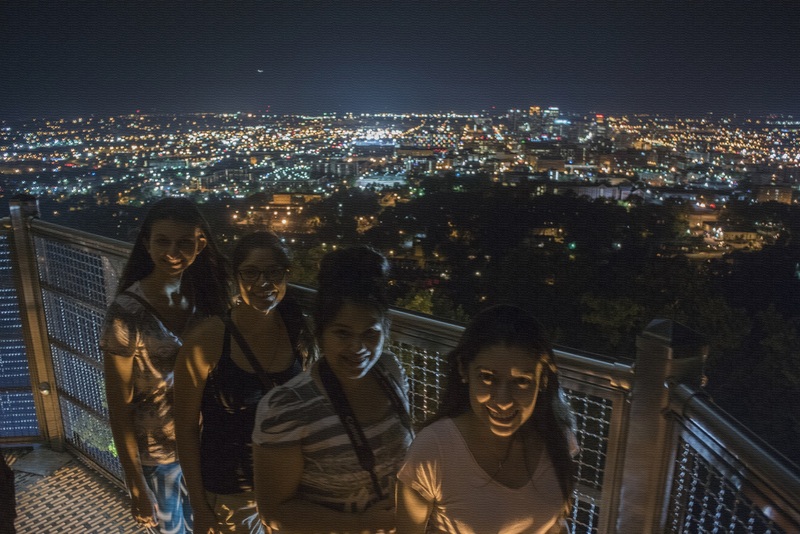 After a delicious dinner at John’s City Diner, we rushed to The Vulcan Park to experience the 65 foot tower overlooking the city. The Vulcan is a Roman methodological figure who was the god of the forge (metal shop). He was an outcast and did not gain relevance until marrying the goddess of love and beauty, Venus. City leaders decided to build The Vulcan in Birmingham for modernization and to represent its success in the industrial business. Looking at The Vulcan was much less intimidating than going up the 65 foot sculpture, but we overcame our fear of heights and made our way up. We gazed upon the beautifully lit city and were captivated. It also gave us a moment to appreciate the history of the Vulcan, its representation, and the contribution Birmingham. Following the Vulcan stop, we headed toward the Kelly Ingram Park. It’s a beautiful, moving park focused on Civil Rights, but 10:30pm on a Thursday night (or any night) is not the time to stop there. 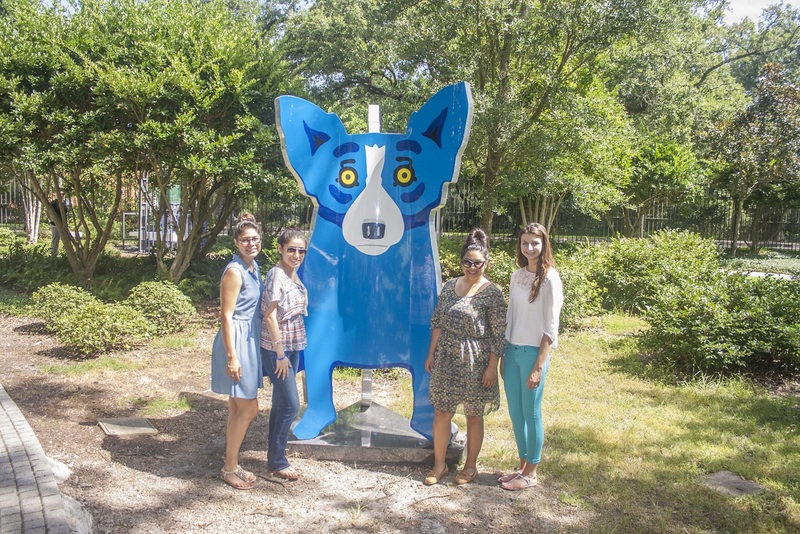 After dodging some shady characters, we were able to see the “Dog Attack” sculpture by James Drake. It is a disturbing and unsettling sculpture designed to give visitors a sense of what African Americans must have felt in the early 1960s, when Birmingham Officials (most notably, Bull Connor) used dogs to intimidate and, at times, maul African Americans. Finally, we departed for our final stop of the day, Atlanta. Hoping to get some rest and be refreshed for a full day of sightseeing tomorrow, we hurried to find our hotel.